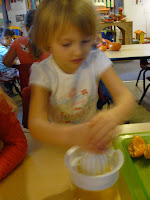 For our cooking activity this week the kids squeezed real orange juice. They were having a ball doing this before I left. Spider webs !!! 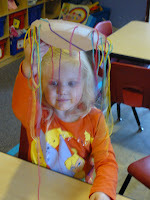 Take a plate and vut notches around the plate and let the kids weave string all around. Look at all the orange shirts! I am in Mountain View Arkansas at a Bed and Breakfast with Rando. We have already been to one country music show last night. It was interesting to watch the people there. There was a man atleast 90 years old clogging. So good to see older people still enjoying life. I know it seems like lately we do travel a lot but usually it is for business. Thanks for being so understanding when we need to be gone. This time was for pleasure and that is rare. BUT! It feels so good to know that I dont have to close and that the kids are in great hands while I am gone. Thanks Beth, Jodi and Michelle for filling in.